The word fuel has a special significance for fitness enthusiasts. For muscle seekers, this extra dash of energy is required to finish one more rep and for competitive athletes, it can spell the difference between that coveted medal and defeat. Branched chain amino acids, comprise of three essential amino acids: leucine, isoleucine and valine and form 40 percent of the daily requirement of amino acids. After you?ve eaten protein, amino acids reach your liver, where they are used as fuel or to rebuild muscles, depending on the need of your body. Rather than monopolizing on BCAAs, the liver shuttles it immediately to the muscles, which makes them an easily available source of fuel for muscles, during intense workouts. Unlike, other amino acids, the muscles can use BCAAs directly for fuel. A fierce training session can set off the process of catabolism or muscle breakdown. After depleting the reserve of muscle glycogen, your body accesses the easily available BCAAs stored in your muscles for fuel. The longer and intense will be your workout faster will be the depletion of BCAAs from your muscles. A BCAAs supplement right before your workout will add an incremental dosage of BCAAs to the reserve. This will give a boost of energy for mean training sessions. Other than providing direct fuel to muscles, BCAAs delay the perception of fatigue. French researchers discovered that during exercise, an amino acid metabolite is known as 5-hydroxytryptamine (5-HT) signals the brain that the body is fatigued, causing it to reduce muscle strength and endurance. The amino acid tryptophan is responsible for producing 5-HT in the brain. Several research studies have confirmed that valine, a BCAA lowers the amount of tryptophan that gets into the brain. Since you feel less fatigued you're able to train for longer duration and push your muscles to the verge of failure. Of the three BCAAs, leucine is the rock star of amino acids. It's by far the most anabolic amino acid, according to the June 2013 issue of the 'Journal of Physiology'. A series of cellular studies show that leucine directly activates a molecular switch called Mtor that tells the body to produce more muscle proteins. So leucine not only provides the building blocks for protein synthesis, it also plays a critical role in -regulating the process. If you are looking to build muscles, it is essential that you keep the level of testosterone (an anabolic hormone) on the higher side as against cortisol which is a catabolic hormone. Studies show that taking BCAAs during resistance training enhanced the testosterone level in the body and lowered the cortisol level in the blood. This means, BCAAs enhance muscle growth and prevents the breakdown of muscle proteins. Therefore, they are highly recommended before, during and after your training exercises to ensure muscle growth and recovery for greater strength, energy and fitness. Several studies go on to prove that BCAAs taken before and after resistance exercise can reduce or delay onset of muscle soreness. In one 12-day-study, participants took either 10g of BCAAs or a placebo twice a day (morning and evening). In addition, after an overnight fast, they further took 20 g of BCAAs one hour before exercise and again immediately afterwards. Muscle soreness peaked two days after the workout. But the level of soreness was significantly lower when subjects took BCAAs. 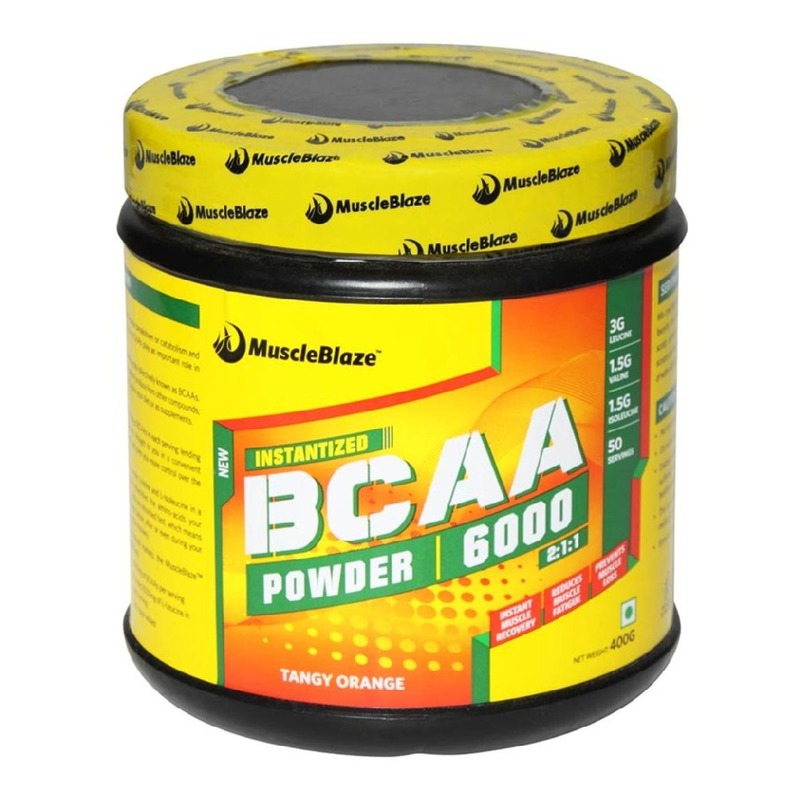 There was also less muscle damage and a faster recovery of muscle function in the BCAA group. Whenever you go to gym and lift weights, you place enormous amount of stress on the body. Research suggests that BCAA may increase the synthesis of muscle tissue and decrease muscle damage during exercise, and it may even contribute to a healthier immune system. Isoleucine, a component of BCAAs promotes muscular endurance by enhancing muscle recovery. It is also required in the production of haemoglobin in the body which is important for training as it supports enough oxygen supply to all parts of the body. Though BCAAs dosage varies from person to person depending on training and age, the recommended dosage for an average person can vary between 1 to 10 g.
Take 5 to 10g of BCAAs supplements half an hour prior to intense training. 2 to 5g of BCAAs can be taken during the workout for better results. Take 5 to 10g of BCAAs or slightly more, for optimum muscle repair and recovery. In essence, if bodybuilding is your aim, BCAAs are a wonderful addition to your supplement arsenal. Try it to supersize your muscle growth. You've heard that 2:1:1 is the right ratio for taking BCAAs (Leucine-Isoleucine-Valine) and often wondered that if leucine is the critical ingredient to bulk up muscles, why can't the ratio be higher? After all, more is merrier and consuming BCAAs with a higher ratio of leucine will be just right to instigate muscle synthesis! The truth is that building muscles require intense training. The longer you work out better will be the outcome. Valine builds your endurance and isoleucine promotes fat loss. While leucine is busy building and repairing muscles, the remaining two provide the fuel to add bang to your training sessions. Be sensible and choose BCAAs with the right mix of 2:1:1 to fuel your workout. The results will be outstanding. Whether you are a beginner or a pro, you should have BCAAs 20 to 30 minutes before workout.